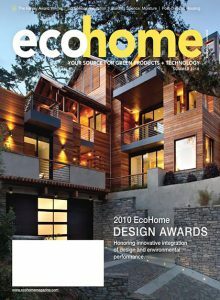 With an outstanding HERS rating of 33 and a spectacular view, the Truro residence — completed in August 2008 — is featured as a Grand Award winner in the summer issue of EcoHome Magazine. Silvia & Silvia was deeply involved in this project, and we’re proud to see the beach house featured in EcoHome. Our exceedingly high knowledge of green building and construction can be seen in this home’s solar panel system, geothermal furnace, foam insulation, sustainable bamboo flooring and energy-saving light fixtures.